That may be true, Mom, and you, dear bloggy friends, are on the receiving end of all my angst-ridden posts. You have been so comforting and supportive as I travel through the grieving process. I hope you continue to bear with me. My Grandma Emma died before many of her grandchildren were born, but I know for a fact that all of her grandchildren will know her immediately when we see her in heaven. We have heard so many stories about her from our fathers and mothers, our aunts and uncles, that when we, too, are taken to our heavenly home, we will instantly recognize our loving Grandma. Yes, this sounds way too schmaltzy, but I believe it with all my heart. And so, another story about Mom, so that Lily and Emmy will recognize their Grandma in heaven. Hands to serve Him all the day. Mom spent all her days praising God. If I were to write a list of all the ways Mom praised God from day to day, it would be a long, long list. Last Sunday, I walked up to communion at our church, and burst into tears. Up at the railing, I knelt upon the cushions that Mom designed and helped to needlepoint. They begin with Alpha, and end with Omega. I wish I had pictures to show you the beautiful Bible stories on these cushions. Mom also designed and made banners to praise God. At her funeral, Dad hung up all the banners she made for their latest church. 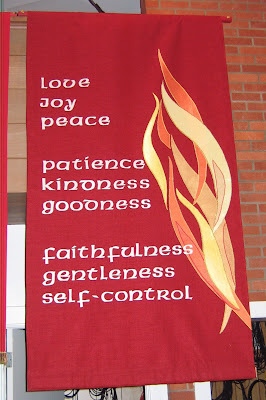 Mom shows the fruits of the Spirit on this banner. (Galatians 5:22) The Spirit gave Mom all of these gifts, and I pray that some day, I will receive these gifts as well. Ginny Marie — I burst into tears when I read this post. My daughter never had the chance to meet her Grandmommy — the one who screamed for a straight minute when we told her we were expecting a baby. But over the past 14 months of motherhood, I have heard my mother's words come out of my mouth to my baby, as if she was teaching and caring for her right there with me. Tears are rolling down my cheeks, thinking of the day when I see Mom in heaven, and I hope with all my heart to introduce Susie, her namesake, to her. May we all worship before the throne above!! I'd love to see those cushions. The banners are beautiful and I'm so glad your dad hung them up at her funeral….Also, I joined your group (um…in your next post) but don't have much to jabber about right now because my toddler refuses to sleep and I'm just wiped from the arguing. 🙂 But I shall survive.Oh and I agree with others….I'll read whatever you write! I'm happy to read whatever you write about! I would love to see the needlepoint cushions that your mom made! Her banner is gorgeous-so talented! My mother was not artistically talented-we used to tease her because she always got supplies and then never did anything with them. We'd call it her "driftwood"-crap she picked up that she thought she NEEDED that turned out to be useless-lol! I'm so glad that you have so many beautiful things that she created to remember her by. Wow, your mom's talents are amazing. And, though I have only begun reading your blog, I think it is wonderful for you to memorialize her in writing. Don't apologize for loving your mom and missing her. It's totally natural. And sharing her stories with us is inspiring!! Oh, what a beautiful banner. How nice that you have so many wonderful memories. Hearing you talk about your mom reminds me of my mom, so keep blogging about her all you want! Well I, for one, like hearing stories about your mom so keep telling them. wow – what a beautiful post! if your mom would say that you are blogging too much about her death, it would be out of humility. she sounds like an amazing woman. i hope to be an example like her to my kids too – just as i am sure (from reading your posts for over a year now) that you are too. What a beautiful post about your mother and grandmother. I love the little saying, so precious. Your mother was very talented. Her examples to you will be passed down to your daughters.